Described as “Hollywood’s best-kept secret,” Revitol Phytoceramides is a product which, according to the manufacturer, aims at rejuvenating your skin. It is said to work by boosting the phytoceramide concentration of the skin, a concentration that decreases with age. It is claimed to offer an injection-free way of promoting younger-looking skin, improving collagen production and enhancing skin elasticity to help reduce wrinkles. It also helps to replace dead skin cells with fresh ones, according to its manufacturer. “Facelift in a pill” offerings such as this are not in short supply these days. How does this one measure up to its purported benefits? Find out in our Revitol Phytoceramides review below. Each Revitol Phytoceramides capsule contains a 350mg phytoceramides complex of organic rice and wheat origin. The ingredient serves as a replacement for depleted ceramides in the skin, eliminating fine lines and reducing wrinkles. The roles of the other ingredients in the cream include providing a protective coating, reducing wrinkles and fine lines, and improving collagen production. They also hydrate and tighten the skin, promote pH balance, enhance skin rejuvenation, and facilitate skin metabolic processes. Revitol does not provide information on how to use this product on its website. It merely states that buyers can read the recommended dosage after purchase. We were able to learn from a third-party source that you are to take one pill a day. As for the cream, it needs to be applied two times daily after washing. You can buy this product online directly from the manufacturer. One bottle of 30 capsules and a 2-ounce jar of cream together as a “sampler” package costs $48. This supply will last for about a month. There are bulk discounts when you buy more. The price of a three-month package drops to $32 per unit and to $28.80 per unit when you order a six-month supply. Free shipping is included with bulk orders. Buyers can take advantage of a 90-day money-back guarantee when they purchase Revitol Phytoceramides. The company says it is confident enough in its product to make that commitment. However, the bravado is undercut by the fact that you can only receive a refund for the unused product. 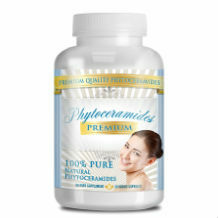 If you are looking to use phytoceramides to revitalize your skin, this could be a product you may want to check out. 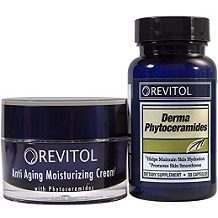 The two-form approach (cream and capsules) makes Revitol Phytoceramides more likely to be beneficial. However, while a refund is possible it is not particularly convincing in terms of the product’s efficacy, given that the money-back guarantee is valid only for product that hasn’t been opened. Another issue we have with the phytoceramides supplement is that its maker strangely makes information on dosage rather hard to access.